Author(s): Dittapong Pairoh, Kanokwan Chaiendoo, Wittaya Ngeontae, Rodjana Burakham. Materials Chemistry Research Center, Department of Chemistry and Center for Innovation in Chemistry, Faculty of Science, Khon Kaen University, Khon Kaen 40002, Thailand. Keywords: Ferrous ion, Silver nanoclusters, Sequential injection analysis. Affiliation:Materials Chemistry Research Center, Department of Chemistry and Center for Innovation in Chemistry, Faculty of Science, Khon Kaen University, Khon Kaen 40002, Thailand. 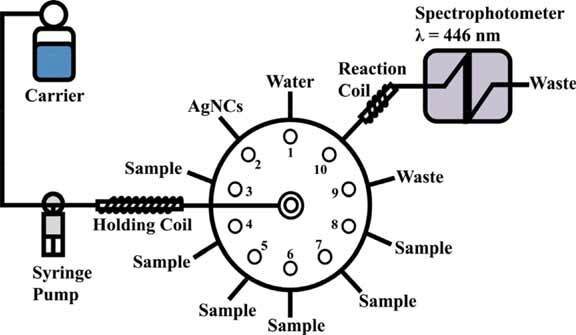 Keywords:Ferrous ion, Silver nanoclusters, Sequential injection analysis.